Jesus raised Lazarus from the dead. It was a tremendous miracle, showing that Jesus has the power to raise us from the dead, too. But there is more to the story than that, and John includes some details that may have deeper meaning for us today. I pray that I do not do injustice to the story as I share some of my thoughts with you. Notice the way that John tells the story: Lazarus was not just a random resident of Judea — he was the brother of Martha and Mary, the Mary who loved Jesus so much that she poured perfume on his feet. “The sisters sent word to Jesus, ‘Lord, the one you love is sick’ ” (John 11:1-3). To me, that sounds like a request for help, but Jesus did not come. Does it ever seem to you like the Lord is slow to respond? It surely did for Mary and Martha, but the delay does not mean that Jesus doesn’t like us. Rather, it means that he has a different plan in mind, because he can see something that we cannot. As it turns out, Lazarus was probably already dead by the time the messengers reached Jesus. Nevertheless, Jesus said that the sickness would not end in death. Was he mistaken? No, because Jesus could see beyond death, and he knew that in this case, death was not the end of the story. He knew that the purpose was to bring more glory to God and his Son (v. 4). 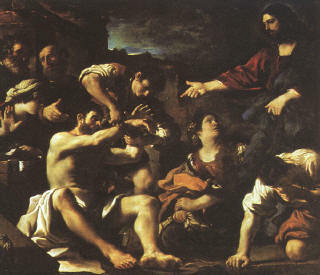 Nevertheless, he let his disciples think that Lazarus would not die. There’s a lesson there for us, too, for we do not always understand what Jesus really meant. Two days later, Jesus surprised his disciples by suggesting that they return to Judea. They did not understand why Jesus would want to go back into the danger zone, so Jesus responded with a cryptic comment about walking in the light, and the coming of darkness (vs. 9-10), and then telling them that he had to go wake Lazarus up. The disciples were apparently used to the mysterious nature of some of Jesus’ comments, and they had a round-about way of getting more information: They pointed out that the literal meaning didn’t make sense. If he’s asleep, then he’ll wake up by himself, so why do we need to risk our lives to go? Jesus explained, “Lazarus is dead” (v. 14). But he also said, I’m glad I wasn’t there. Why? “So that you may believe” (v. 15). Jesus would do a miracle that would be more astonishing than if he had merely prevented a sick man from dying. But the miracle was not just in raising Lazarus back to life — it was also the knowledge that Jesus had of what was going on perhaps 20 miles away, and the knowledge of what would happen to him in the near future. 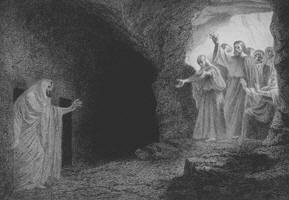 He had light that they could not see — and this light told him of his own death in Judea, and of his own resurrection. He was in complete control of the events. He could have avoided arrest if he wanted to; he could have stopped the proceedings with a simple word, but he did not. He chose to do what he did because that’s what he had come for. The man who gave life to the dead would also give his own life for the people, for he had power over death, even his own death. He became mortal so that he could die, and what looked on the surface to be a tragedy was actually for our salvation. I don’t want to imply that every tragedy that happens to us is actually planned by God, or is good, but I do believe that God is able to bring good out of evil, and he sees realities that we cannot. He sees beyond death, and his mastery of events is no less today than it was back then — but it is often just as invisible to us as it was to his disciples in John 11. We simply cannot see the bigger picture, and sometimes we stumble in the darkness. We have to trust God to work it out in the way that he knows is best. Sometimes we are eventually allowed to see how it works out for good, but often we just have to take his word for it. 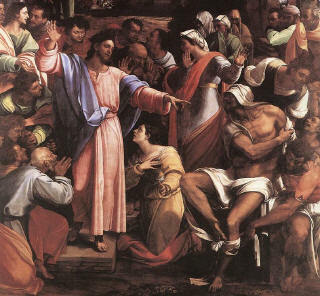 Jesus and his disciples went to Bethany and learned that Lazarus had been in the tomb for four days. The eulogies had been given and the funeral was long over, and the doctor finally shows up! Martha said, perhaps with a little exasperation and hurt, “Lord, if you had been here, my brother would not have died” (v. 22). We called for you several days ago, and if you had come then, then Lazarus would still be alive. But Martha has a glimmer of hope — a little bit of light: “But I know that even now God will give you whatever you ask” (v. 23). Maybe she felt that it would be a little too bold for ask for a resurrection, but she hints at something. And Martha, in one of the most outstanding statements of faith in the entire Bible, said: “Yes, I believe that. You are the Son of God” (v. 27). Life and resurrection can be found only in Christ — but can we, today, believe what Jesus said? Do we really believe that “whoever lives and believes in me will never die?” I wish we all could better understand that, but I do know for sure that in the resurrection, we will be given a life that will never end. In this age, we all die, just like Lazarus did, and Jesus will have to “wake us up.” We die, but that is not the end of the story for us, just as it was not the end of the story for Lazarus. Martha went to get Mary, and Mary came to Jesus weeping. Jesus wept, too. 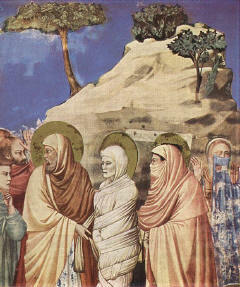 Why did he weep when he already knew that Lazarus would live again? Why did John report this, when John also knew that joy was just around the corner? I don’t know — I don’t always understand why I weep, even at happy occasions. But I think it does tell us that it’s OK to weep at a funeral, even if we know that the person will be resurrected into immortal life. Jesus promised that we will never die, and yet death still happens. It is still an enemy, still something in this world that is not the way it’s supposed to be in eternity. Even if eternal joy is just around the corner, sometimes we have times of great sadness, even though Jesus loves us. When we weep, Jesus weeps with us. He can see our sadness in this age just as well as he can see the joys of the future. “Roll away the stone,” Jesus said, and Martha objected, “There’s going to be a bad smell, because he’s been dead for four days.” Is there anything in your life that stinks, anything that you don’t want Jesus to expose by “rolling back the stone”? There is probably something like that in everyone’s life, something we’d rather keep buried, but sometimes Jesus has other plans, for he knows things that we do not, and we just have to trust him. So they rolled back the stone, and Jesus prayed, and then he called out, “Lazarus, come out!” “The dead man came out,” John reports — but he was no longer dead. He was wrapped up like a dead man, but he was walking. “Take off the grave clothes,” Jesus said, “and let him go” (vs. 43-44). Jesus calls out to spiritually dead people, today, too, and some of them hear his voice and walk out of their graves — they come out of the stench, they come out of the self-centered way of thinking that leads to death. And what do they need? They need someone to help them unwrap the grave clothes, to get rid of the old ways of thinking that so easily cling to us. That’s one of the functions of the church. We help roll back the stone, even though there may be a stench, and we help the people who are responding to Jesus’ call. Do you hear Jesus calling you to himself? It’s time to walk out of your “grave.” Do you know someone Jesus is calling? It’s time to help roll back their stone.